February chill got you down? Ward off the cold with this darling Elisabetta Plaid Poncho look! 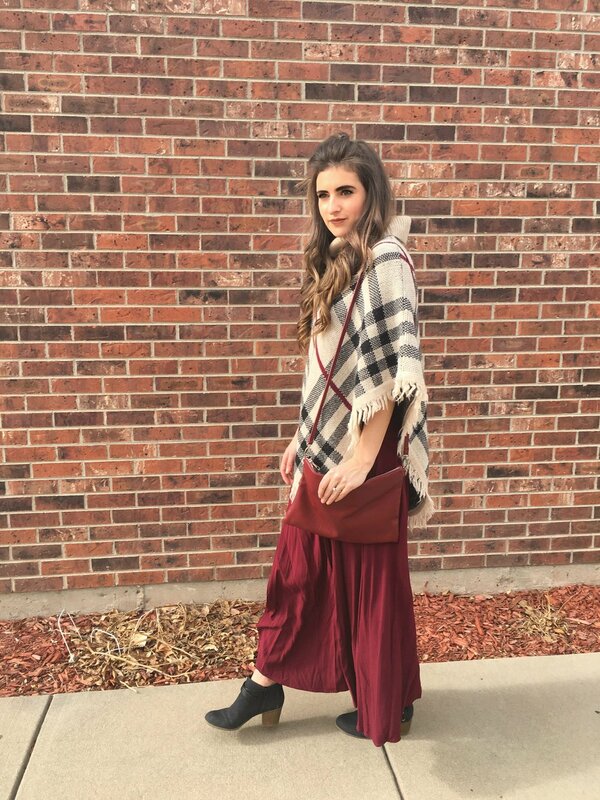 We threw this poncho over a burgundy maxi dress but since the poncho incorporates the colors white, cream, taupe, black and burgundy, your options of what to pair this poncho with are really endless. Feel free to lose the poncho and spice up this look! The fitted bodice and apron neckline of this maxi dress are gorg and we love the slits up the side. We snagged this dress from Forever 21 and although not available anymore, we linked an almost identical dress that can be found at Lulu’s for only $64! For the dainty details, we paired this look with a black leather choker and a burgundy cross body purse. We love these Indigo Rd. Sigrid Booties from DSW selling for only $49.95. They come in four different colors and are so cute and comfortable. The buckle straps make for great accents to the shoe and the 2 ¼” stacked block heel make this a more casual bootie; great for brunching or lunching! Hope you had a hopping weekend! Texts from Last Night. Installment 1.